Today in this post I will tell you about Google one more advertisement which gives error 404. As before Google have come up with one more advertisement which gives error 404. Last time Google did a Hoarding advertisement for Google Chrome, in which the given URL returns error 404, that bug is now fixed. This time Google is doing online text ad for Orkut (see ad in below image), which hedge to be a popular Social Networking website run by Google. So to promote it Google is doing ad for it, which gives error 404. 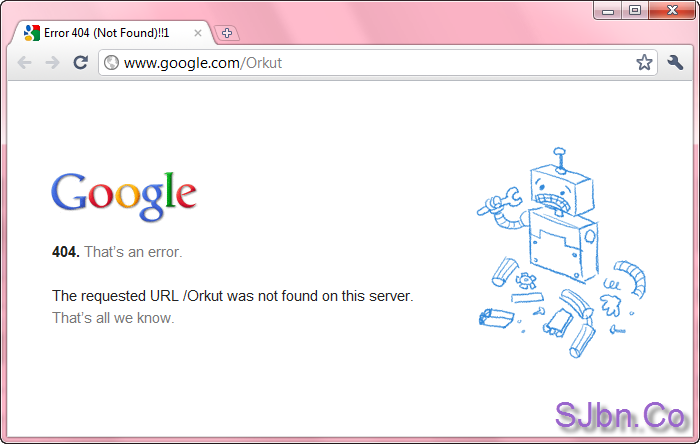 When you go to given link (www.google.com/Orkut) in above ad you will get error 404. And funniest part is in whatever case you write Orkut after www.google.com/ you will only get error 404 page like www.google.com/ORKUT, www.google.com/orkut, www.google.com/OrKuT. Same mistake is been done again that also by the same company, from whom we have lots of expectations. What you have to say about the same mistake done by Google again? does clicking on the ad work?? No, I didn't clicked but I am sure that by clicking it wouldn't have given Error 404..
Just now I saw that same ad again I checked it, it is going to orkut.co.in..